Never cooked before? Still a beginner? Then we have lots of help just for you! Klick hier fuer die deutsche Version. Welcome to letsCOOK, the uk home of great cooking on the internet. 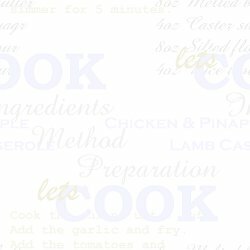 This site is dedicated to bringing you recipes that are easy to cook and give great results. Recipes you can trust! We personally test every recipe to make sure they really work. Enjoy the site. A very quick and easy recipe for Chinese style Chilli Chicken. This is really delicious! Our recipes are listed on the Web's Best Recipes. Chinese style stir fry, delicious quick and healthy. Our Quick Cook recipe section contains recipes that take 30 minutes or less! All content copyright M C Waters 2002. Please enjoy the site!